Kulchiny was one of thousands of small communities that dotted Eastern Europe. It has a mixed population of Christians and Jews. 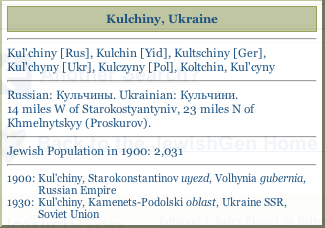 In 1765, the Kulchiny Jewish population numbered a mere 177 souls and, at its height in 1897, there were 2,031 Jews, comprising 47% of the population. Tucked in among the expansive rolling wheat fields of Ukraine, it was an isolated microcosm of rural Jewish shtetl life. Accessible, even today, only by an unpaved dirt road, its isolation kept the Jewish inhabitants closely bound for survival in a hostile gentile environment. The Kul'chiny of today has only two things in common with that Ku'chiny of old. It shares the same coordinates on a map and only two houses stand today from that former community. Most of old Kulchiny's Jews were small-scale traders, craftsman, or artisans. Their thriving local market was the envy of the neighboring villages. Theirs was a close knit and cooperative community that weathered the Pogroms, the Russian Revolutions, and the frequent political upheavals in that area. At the end of the 19th century and the beginning of the 20th, it was poor. Any real sense of hope, growth, or expansion was quelled. Hence, many of its inhabitants left, the majority making the arduous trip to America while others scattered about Europe. But, for Kulchiny’s remaining inhabitants, it remained their home - snug, predictable, reliable - where their existence was based upon decades of tradition and religious beliefs. Then, in the fall of 1942, Ukrainian police moved the Kulchiny Jews into a ghetto. Soon after, the Jews were marched to the neighboring village of Antoniny and then to the woods of Manivsti where a large pit was dug. The Ukrainians cordoned off the pit and German SD (Security Service) soldiers shot the Jewish population. In Kulchiny, the empty Jewish houses, businesses and religious buildings were dismantled. Presently, other than a single grave stone, lying face down in an unused fiield, and the two empty homes, there is not a single physical item left of the of hundreds of years of rich Jewish life. The current Kulchiny villagers have no memory of the contribution, history, or fate of their former Jewish neighbors. Butterflies don't live in here, In the ghetto.